Virtual private servers are for those people who have considerable web presence but do not want or have the need to own a personal dedicated server. A virtual private server is split (using special software) into two or more segments, which are apportioned to different customers. From a customer standpoint, it feels as if you have the server to yourself – you have full administrative rights to your segment and each website behaves as if it is being served by a dedicated server. Further, server management and maintenance is carried out by your web hosting provider. Disk Space and Bandwidth will be important considerations, especially if you expect growth and may need to upgrade to a larger plan. You will be looking for a host that has a number of virtual hosting plans, provides a selection of e-commerce features and is rich with scripts and programs. Software and script support is a key aspect of virtual private hosting as most clients will develop or purchase their own scripts, especially for e-commerce and merchant solutions. Therefore, it is important that the host supports a wide range of script languages and software applications. In relation to other features and configurations, most providers will give their clients the ability to make their own customizations and configurations to suit individual preferences. Multimedia and visual effects will also be important at this level – visually attractions will help promote traffic and sales. Extensive 24/7 customer support is paramount as downtime or errors in your web host will translate into dollars lost. In relation to virtual private servers, Web Hosting Buzz and Arvixe Hosting offer the best deals. Web Hosting Buzz is the most cost effective with 7 plans that start from $14.95 a month and go up to $104.95 a month. All plans offer unlimited website and domain hosting, cPanel and WHM control panels. The cheapest plan at Web Hosting Buzz offers 1 IP address, 1 CPU core, 1 GB RAM, 20 GB of storage space and 250 GB bandwidth. The most expensive (yet cost effective in terms of features) plan offers 4 IP addresses, 4 CPU cores, 7 GB RAM, 140 GB storage space and 1750 GB bandwidth. 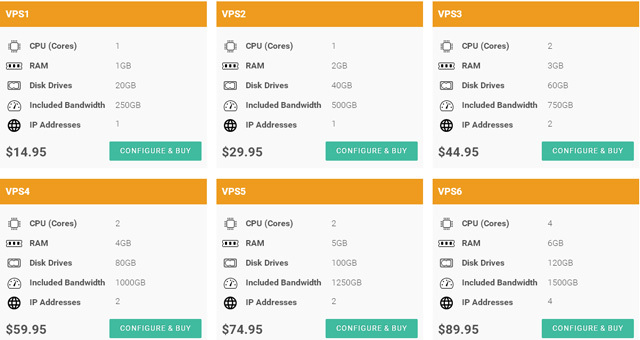 Arvixe Hosting offers 3 VPS plans from $20 a month to $70 a month. The starting plan offers 20 GB disk space, unlimited bandwidth, 1 GB RAM, 2 CPU cores, and 1 IP address but does not offer cPanel or WHM control panel. The highest plan offers 100 GB disk space, unlimited bandwidth, 3 GB RAM, 8 CPU cores, 2 IP addresses and cPanel/WHM as well. Whilst Arvixe is more expensive than Web Hosting Buzz, it is a robust web hosting provider offering real value in virtual private servers. Both Arvixe and Web Hosting Buzz offer full range of 24/7 toll free and live chat customer service. As an addition, both providers also have online tutorials and stacks of online resources including forums, articles and answers to previously asked questions.